I was on a bag-making roll and decided to make view D of the Lisette Foreign Exchange Bag pattern. Working with a more muted color palette than suggested on the pattern cover, I used some Japanese taupe fabric. It's hard to see in the picture, but the fabric has a wonderfully nubby woven texture and feels just a bit more expensive than normal quilting cotton. And I also got to use a fun super large button. 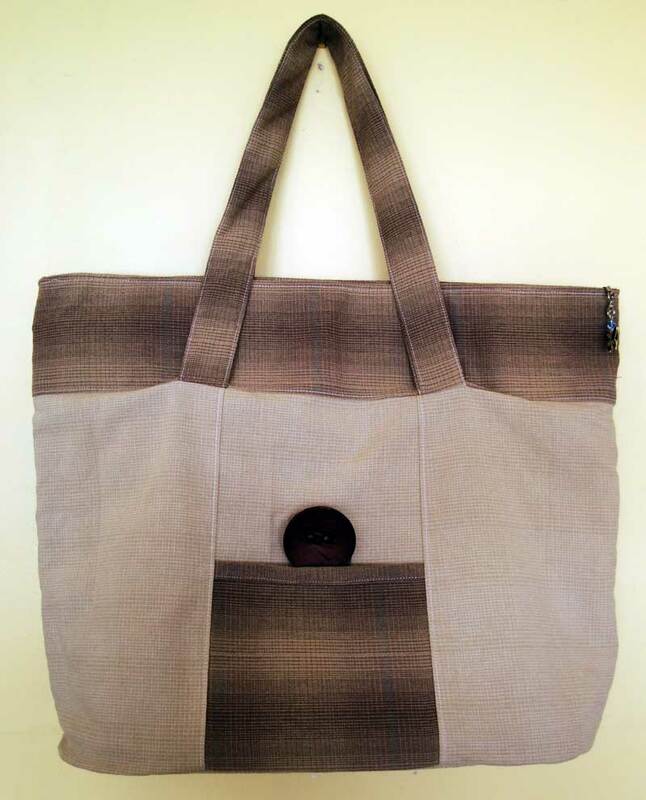 View D (12" x 17") is a much smaller bag than the View B bag (14" x 18") so all I needed for the exterior and handles were 2 fat quarters of the lighter color and 1 fat quarter of the darker one. The interior used the remaining bit of the darker fat quarter and one additional fat quarter of a coordinating color. I also wanted to alter the pattern a bit and try to install a top zipper for the first time. It was a lot of fiddly work and the zipper didn't come out perfectly, but it's a solid first attempt. 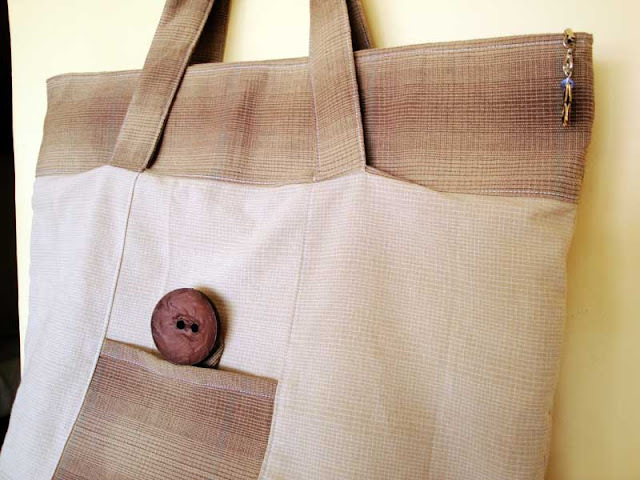 Were I to make this bag again, I would fuse batting on both the exterior and the lining. This one only has batting on the lining because I didn't want the exterior to look wrinkly, but the fabric is such that wrinkling adds to its charms. I also would use a different interfacing for the handles. Maybe some thinner batting for cushioning. The one I used was the sew in kind and the result is a bit of crunchy feel to the handles. Interfacing the inset and zipper parts with decor bond was a good idea. 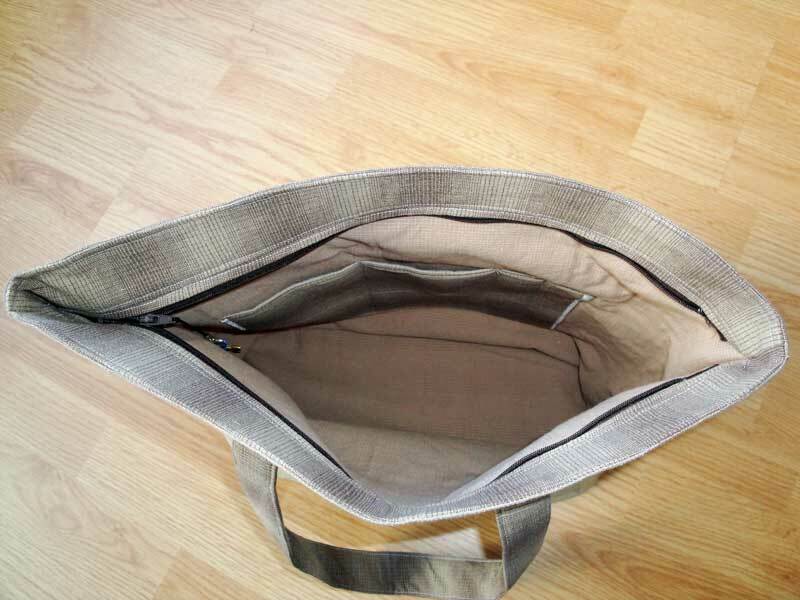 It helped to have that extra firmness and solidity when working with the zipper. Also, I hate basting, but when making this bag, basting was my friend and it helped everything from getting frustratingly wonky.